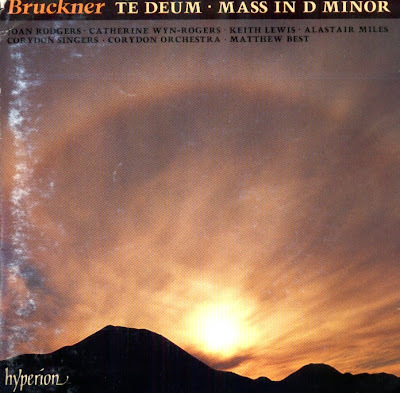 The quality which most powerfully characterizes Bruckner's music is its religious mysticism. Not only the sacred works, but also the symphonies which form the bulk of his output, display a religiosity which is not grafted on but deeply ingrained. The D Minor Mass is a natural successor to the classical settings of Haydn and Mozart, conceived symphonically and with the orchestra allotted a prominet role. It was from Haydn and Mozart that Bruckner learned the cyclic principle in which the final Agnus Dei recalls material from earlier movements. From his beloved Schubert he acquired lyricism and lush harmony, while his innate sense of the monumental and his grounding in the counterpoint of J.S. Bach equipped him perfectly to write music on the grandest scale. Liszt and Wagner, also, were influences, the one chiefly in matters of thematic development, the other in melodic and harmonic innovations and in the size and use of the orchestra. It was not until the age of forty, when he wrote the D Minor Mass, that Bruckner showed the first real signs of artistic maturity. The composer himself conducted the premiere of the D Minor Mass in Linz Cathedral on 20 November 1864, and its favourable reception ensured its repeat at the Redoutensaal, also in Linz, on the 18 December 1864. After the November performance the critic of the Linzer Abendbote had proounced it "the best work of its type to be created for a long time." Bruckner had begun work on the Te Deum in May 1881, almost contemporaneously with the sketches for his Seventh Symphony, but it was not until September 1883 that he gave it his full attention. The Te Deum calls for soprano, contralto, tenor and bass soloists, four-part choir, organ and orchestra, though the organ is optional. Bruckner completed the Te Deum in March 1884 and it was first performed, accompanied by two pianos, on 2 May 1885. Hans Richter conducted the first performance with orchestra in Vienna on 10 January 1886. Even the normally vicious Hanslick, who never forgave Bruckner's espousal of Wagner, was uncharacteristically polite. The CD was released by HYPERION, 1993 (DDD). Hyperion CDA 66650. Thank You, Matthew Best, for this unbelievable recording !